When the tendons that attach at the heel and the foot bones pull properly, your foot’s arch is normal with a noticeable gap underneath. When they don’t pull properly, the arch partially or completely collapses. This is what is known as a flat foot or fallen arch. Flat feet can be congenital or acquired. There are different types of flat feet. Flexible flat feet are those that have some arch. The arch flattens when standing and returns when not standing. There may be no pain or treatment required. The most common type of flat feet, it more often than not affects both feet. Rigid flat feet may be due to bone problems, disease, or injury. Painful, it is accompanied by stiffness, and the foot is unable to be flexed. There are two arches on each foot. Ligaments, plantar fascia, muscles, and foot pads work together to form the arches. An abnormal structure or injury to any one of them can cause flatfoot. age and the impact of years of wear and tear on the feet. If flat feet develop during adulthood, the condition is usually permanent and irreversible. Flexible flat feet are normal in infants and toddlers. Loose tendons tighten and form an arch by the time children are two or three years old. Usually, children develop an arch by the time they reach adolescence. In rare cases, however, two or more bones in a child’s foot grow together. Tarsal coalition, as this is called, results in painful flat feet. With most types of flat feet, the toes and the front part of the foot turn outward, the Achilles tendon is tight, and the ankle seems to turn in. A person with flat feet may have difficulty finding proper fitting shoes. In cases of rigid flat feet, some people experience additional symptoms of pain on the outside of the foot or in the ankle, heel, or arch; pain along the shin bone and in the calf, lower back, hip, or knee; swelling; difficulty in moving the foot; and/or fatigue. Children may experience foot, ankle, or lower leg pain. Asimple way to see if you have flat feet is to wet your feet and step onto a dry, flat surface. If your footprint is filled in, you probably have flat feet. If your toes, foot pads, and heels are distinct, then you probably do not have flat feet. There are symptoms for which a “simple” self-diagnosis is not best, however. Dr. Burmeister should be consulted in order to make a proper diagnosis and to set a proper course of treatment. Use an MRI scan to look at the tendons or a CT scan/x-ray to look at the bones in order to determine the cause of your flat feet. Many people have flat feet but have no symptoms requiring treatment. Your course of treatment will depend on the kind and cause of flat feet you have. Flat feet may be treated by nonsteroidal anti-inflammatory drugs (NSAIDS), orthotics, immobilization, ice, weight loss, physical therapy, activity modifications, shoe modifications, and/or corticosteroid injections. As long as a child is not experiencing pain or difficulty walking, they do not usually need treatment. If they have tarsal coalition, treatment may be as simple as immobilization and a cast. For most people, the treatments are successful. For others, surgery may be considered. When these treatments are not successful, there are surgical procedures that can be done to improve bone alignment and to relieve pain. After taking into consideration the diagnosis, your age, and other factors, one or a combination of the following procedures may be used to repair flat feet. Osteotomy – Alignment is corrected by cutting and reshaping a bone. Excision – A bone or bone spur is removed. Tendon transfer – A piece of one tendon is used to lengthen or replace another. Arthrodesis – One or more of the bones in the foot or ankle are fused together. Arthroeresis – A small device is placed in the subtalar joint to limit motion. Synovectomy – The sheath that covers the tendon is cleaned. Recovery periods depend on the procedure(s) chosen. Most cases of flat feet cannot be prevented. Maintaining a healthy weight, however, will go a long way toward prevention. If you are experiencing the symptoms of flat feet, Dr. Jeffrey Burmeister, DPM, and his experienced staff are ready to fully diagnose, treat, and see you on your way to pain-free living. 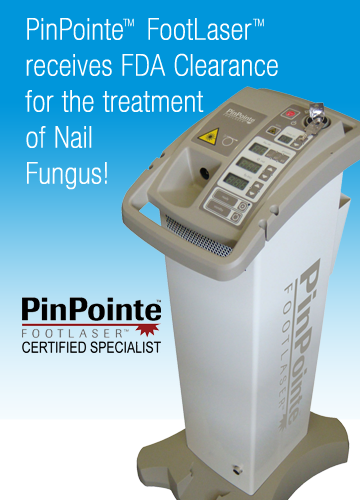 Schedule an appointment by calling (904) 765-8889 or by completing an online appointment request at www.jacksonvillefootandlaser.com/contact.html .